BCRF sat down with Dr. Olufunmilayo Olopade to discuss her current work and interest in breast cancer research. Read on to learn more. A: My interest in bridging the gaps between clinical services, translational research, and basic science investigations in cancer genetics led to the establishment of the Center for Clinical Cancer Genetics at the University of Chicago. By establishing and maintaining a large and growing database of high-risk individuals, I am able to examine the contribution of germline BRCA1 and BRCA2 mutations in diverse populations. 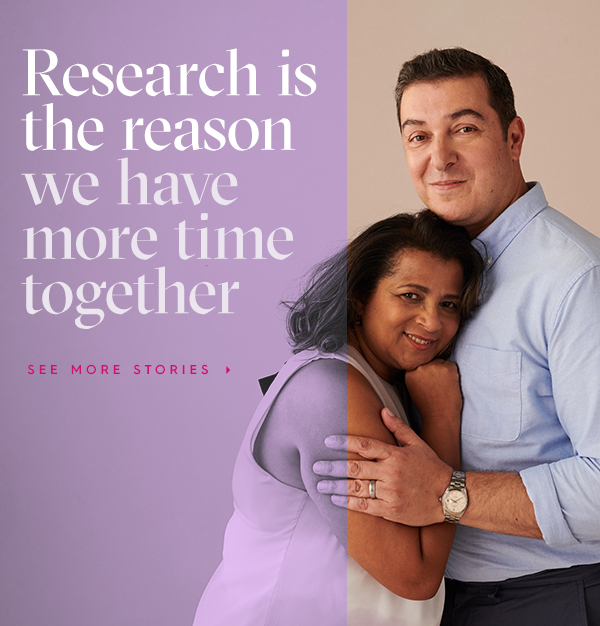 Our laboratory was the first to describe recurrent BRCA1 mutations in extended African American families with breast cancer, a study that we have extended to the founder population of African Americans in West Africa. We recently found that breast cancers in African women often produce a pattern of gene expression that is significantly different from that seen in Caucasians. Tumors of African women are more likely to be "basal like" or estrogen receptor negative and originate from a different group of cells within the breast. These tumors are less likely to present the molecular targets that form the basis of many standard therapies. We are interested in understanding the importance of epigenetic regulation of BRCA1 in sporadic breast cancers and have proposed a model for breast cancer progression whereby BRCA1 methylation can substitute as a first event, much like an inherited germ-line mutation, and promote tumor progression down a restricted set of molecular pathways. A: Our focus on women of African ancestry who share a disproportionate burden of aggressive young onset "basal-like" breast cancer is expected to reveal previously unmeasured gene environment interactions in disease causation that underlie disparities in health outcomes. We hope to develop novel treatment approaches with fewer side effects for young women. Q: Who do you think will benefit from your research? A: A better understanding of the most aggressive type of breast cancer in young women will lead to improved methods for prevention, early detection and treatment of all breast cancers. Currently we have no good understanding of how to best treat young women with "basal like" breast cancer. These women have a different set of criteria that we must now consider when treating them, such as wanting to have families after diagnosis, etc. Up until now, older Caucasian women have provided the base line information for breast cancer prevention and treatment, and this leaves a large portion of the population out of the equation. Hopefully our study will affect that in a positive way. All women will eventually benefit. Q: How close do you think we are to preventing or finding a cure for breast cancer? A: We have made significant progress. In women whose breast cancer is diagnosed at an early stage and is localized, 98% survive more than 5 years. For all stages of breast cancer, the 5-year survival rate is 88%. Currently, we believe there are 2 million women, at minimum, living in the U.S. who have survived breast cancer. Q: How has The Breast Cancer Research Foundation been helpful to you? A: BCRF has been instrumental in sustaining our research in young women at high genetic risk for breast cancer. Nigeria, a country of 150 million people, had no pathology services that could reliably perform immunohistochemistry for breast cancer until BCRF came to the rescue. Now, with support from BCRF, a state of the art immunohistochemistry laboratory has been established in Nigeria to support the 1st multi-center breast cancer treatment trial in Africa. Read more about Dr. Olopade's current research project funded by BCRF.